The image below gives a basic overview of the Sun's parts. The three major interior zones are the core (the innermost part of the Sun where energy is generated by nuclear reactions), the radiative zone (where energy travels outward by radiation through about 70% of the interior of the Sun from the core out), and the convection zone (in which convection currents circulate the Sun's energy to the surface). The flare, sunspots and photosphere, chromosphere, and the prominence are all clipped from actual Solar and Heliospheric Observatory (SOHO) images of the Sun. A display of colored light given off by collisions between charged particles in a planet's magnetic field and atoms of atmospheric gases near the planet's magnetic poles. Aurora are visible on Earth as the aurora borealis or northern lights and the aurora australis or southern lights. Daniel Hershman captured this dazzling picture on August 12, 2000, at Sunrise Point in Mt. Rainier National Park, WA. The three bright lights near the right side of the image are Jupiter, Saturn and the red star Aldebaran. The outermost layer of the solar atmosphere. The corona consists of a gas that is much thinner than the Earth's atmosphere. The temperature is greater than one million degrees centigrade. It is visible to the naked eye during a solar eclipse. This coronagraph image shows the dark occulting disk over the bright Sun so that we can see the less bright corona. The white circle shows where the Sun would be if uncovered (see coronagraph). The movement of matter due to changes in temperature and therefore density. Warm material rises because it is less dense (lighter) and cool material sinks because it is more dense (heavier). Image of Granules. These features are the tops of convection cells on the Sun where hot fluid rises up from the interior in the bright areas, spreads out across the surface, cools and then sinks inward along the dark lanes. Individual granules last for only about 20 minutes. Each granule is about the size of Texas. Image from the Swedish Vacuum Solar Telescope. In the Sun, the convection zone extends from just below the photosphere to the radiative zone. In this region convection currents circulate the Sun's energy to the surface. In solar astronomy, the innermost part of the Sun, where energy is generated by nuclear fusion (fusion of one atom to another). An instrument which studies the Sun's outer atmosphere, the "corona". From Earth this is most easily seen during a total eclipse. SOHO has two coronagraphs which study the Sun from space. A very common way to observe the corona is to cover the bright disk of the Sun. This creates a sort of false eclipse and allows us to see the Sun's fainter outer atmosphere. A coronagraph (here the SOHO/UVCS instrument) helps show the Sun's outer atmosphere (outside of inner black circle). The coronagraph does not image the Sun's disk, but another Sun image (from SOHO/EIT) is superimposed on the area where the Sun's disk would be. An area of the corona which appears dark in ultraviolet light. They are usually located at the poles of the Sun, but can occur other places as well. The magnetic field lines in a coronal hole extend out into the solar wind rather than coming back down to the Sun's surface as they do in other parts of the Sun. Because the magnetic field lines go out into space they take hot material with them making the area cooler than the rest of the bright hotter surface. This ominous, dark shape sprawling across the face of the active Sun is a coronal hole -- a low density region extending above the surface where the solar magnetic field opens freely into interplanetary space. Coronal holes are known to be the source of the high-speed solar wind. A huge magnetic bubble of plasma and magnetic field lines that erupts from the Sun's corona over a course of several hours and travels through space at high speed. The charged particles and magnetic fields can cause power and communications outages, loss of satellites, and cause health problems for astronauts if the CME passes the Earth's magnetosphere. The atoms and molecules of a gas are in constant motion, colliding rapidly and filling all available space. The hotter the gas, the faster they move, and the more energy each of them holds. The free ions and electrons in a plasma behave the same way. Ions and electrons actually observed in space are often much, much more energetic, and may move at a fraction of the velocity of light (300,000 km/sec or 186,000 miles/sec). One theory is that these particles get energized by electric and magnetic processes, not just by mere heat that causes the change from a solid to a liquid and then a gas. A structure in the corona consisting of cool plasma supported by magnetic fields. In visible light filaments are dark structures when seen against the bright solar disk, but appear bright when seen over the solar limb. Filaments seen over the limb are also known as prominences. Filaments may become parts of CME's if they lift off of the Sun. Ultraviolet light image of a filament lifting off of the surface of the Sun. Notice how dark the filament is. A collage of erupting prominences (also known as filaments) on the edge of the Sun seen in another "color" of ultraviolet light. Rapid release of large amounts of energy from a small region on the Sun in the form of electromagnetic radiation and energetic particles. 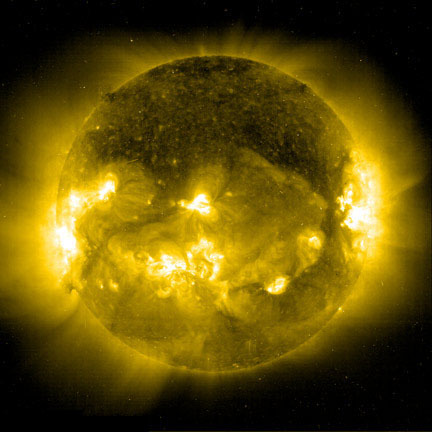 The Sun unleashed a powerful flare on 4 November 2003 that could be the most powerful ever witnessed and probably as strong as anything detected since satellites were able to record these events in the mid-1970s. A worldwide disturbance of the Earth's magnetic field, associated with solar activity. These storms can cause power outages, communications blackouts, health risks for astronauts, loss of satellites and aurora. The heat that we feel from sunlight, a fire, a radiator or a warm sidewalk is caused by infrared radiation. Although our eyes cannot see it, the nerves in our skin can feel it as heat. Sometimes when looking at the Sun in infrared we can see details in the corona or below the photosphere we can not see in white light. An atom or molecule that has lost or gained one or more electrons and has become electrically charged as a result. The process by which ions are produced, typically occurring by collisions with atoms or electrons, or by interaction with electromagnetic radiation. Imaginary lines that indicate the strength and direction of a magnetic field. The orientation of the line and an arrow show the direction of the field. The lines are drawn closer together where the field is stronger. Charged particles move freely along a magnetic field line, but are kept from moving to other lines. Magnetic field lines being drawn around a cow magnet. Notice the arrows and which way they point. The magnetic field of the Sun (at the low point in the solar cycle called solar minimum) and the Earth look much like this. See that the magnetic loops on the Sun in the image below look much like the drawing above. Images of magnetic field lines making loops between two sunspots. Note that there are multiple lines that form a 3-dimensional structure like what you find around a bar magnet. Images of magnetic field lines making loops between two sunspots. Note that there are multiple lines that form a 3-dimensional structure like what you find around a bar magnet. Area around a planet in which the planet's magnetic field is stronger than the magnetic field carried by the solar wind. Image not to scale! The Earth's magnetosphere is distorted by the Sun's magnetic field pushing magnetic lines in toward the Earth on the Sun side and stretching them out on the space side. The layer of the Sun from which the light we actually see (with the human eye) is emitted. Plasma is often considered the fourth state of matter (besides solid, liquid, and gas). Plasma consists of a gas heated to sufficiently high temperatures (in other words, with so much energy) that the atoms ionize (lose electrons). The properties of the gas are controlled by electromagnetic forces among constituent ions and electrons, which results in a different type of behavior. Most of the matter in the Universe is in the plasma state. Lightning and fluorescent lights are plasma. You can get plasma spheres in novelty shops. They are known as lightning balls. The lightning will follow your finger around the globe. SOHO observes an elongated "eruptive prominence," a mass of relatively cool plasma, into space. Lightning (a form of plasma) over NASA's Marshall Space Flight Center, Huntsville, Alabama. A structure in the corona consisting of cool plasma supported by magnetic fields. In visible light, prominences are bright structures when seen over the solar limb, but appear dark when seen against the bright solar disk. Prominences seen on the disk are also known as filaments. Prominences may become parts of CME's if they lift off of the Sun. Two prominences erupting at the same time. Energy that travels through space at the speed of light and moves by the interaction of electric and magnetic fields. This radiation transports energy. An interior layer of the Sun, lying between the core and the convection zone, where energy travels outward through the slow radiation, absorption, and re-radiation of energy by tightly packed atoms. A kind of electromagnetic radiation, like light, but far beyond the red or even the infrared portion of the spectrum. When a solar flare or coronal mass ejection erupts, hot, charged particles are accelerated away from the Sun. When this happens, a radio signal is emitted that reaches Earth in a little over 8 minutes. The approximate 11-year pattern in the number of sunspots, coronal mass ejections (CME's), solar flares, and other solar activity. About every 11 years the Sun's magnetic field changes from north to south. Eleven years later it will flip back. People may have heard of this as the 22 Year Cycle since after two - 11 year cycles the Sun's magnetic field will be back the way it was at the start of the 22 years. Monthly Average Sunspot Number From 1750 to 2004. Notice the cyclic pattern in the data. Also notice that the pattern is almost a sine wave. This is the most common pattern in nature. Space Weather refers to conditions on the Sun and in the solar wind, and the Earth's magnetosphere, ionosphere, and thermosphere that can influence space and ground-based technological systems and can endanger human life or health. Adverse conditions in the space environment can cause disruption of satellite operations, communications, navigation, and electric power distribution grids, leading to a variety of socioeconomic losses. This composite image presents the three most visible elements of space weather: a storm from the Sun, aurora as seen from space, and aurora as seen from the Earth. The solar storm is a corona mass ejection (composite from SOHO). The middle image from Polar's VIS imager. Lastly, Jan Curtis took this image of an aurora display in Alaska. Solar wind is the plasma coming out of the Sun in all directions at very high speeds -- an average of about 400 km/sec, almost a million mph! Solar Wind is responsible for the tails of comets pointing away from the Sun and the shape of the magnetic fields around the planets. Solar wind can also have a measurable effect on the flight paths of spacecraft. This image of Comet Hale-Bopp is courtesy of Fred Espenak, NASA GSFC. The Sun would be to the right of the comet. The solar wind pushes the tail to the left. A device that separates light by wavelength (color) in order to produce a spectrum that allows for the identification of elements within the light source. A temporary disturbed area in the solar photosphere that appears dark because it is cooler than the surrounding areas. Sunspots are made from strong magnetic fields. They usually occur in pairs or groups of opposite polarity that move together across the surface of the sun. Sunspots are the footprints of magnetic loops. The loops push through the surface of the Sun. The magnetic loops push or hold plasma below the surface. Because the footprint is a little cooler it appears to be darker against the bright surface. The black dot shows the approximate size of the Earth next to a massive sunspot. Area of the Sun's atmosphere with temperatures in between those of the chromosphere and the corona, 20,000 - 1,000,000 degrees C.
Energy on the electromagnetic spectrum just beyond violet in visible light and is therefore invisible to the eye. Ultraviolet radiation from the Sun causes sunburns and even skin cancer. Ozone in the upper atmosphere of the Earth protects us from most ultraviolet rays. Because ultraviolet light is absorbed by ozone in the atmosphere, ultraviolet astronomy is performed in space. A comparison of two images of the Sun taken in ultraviolet by the Extreme Ultraviolet Imaging Telescope (EIT) on SOHO. The images, almost two years apart, illustrates how the level of solar activity changes.